BARCELONA, Spain, February 25, 2014 …TrulyHandsfree™ Voice Control 3.0 Named Best Mobile Technology Breakthrough. 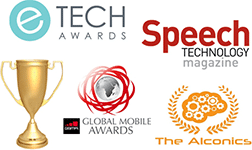 Sensory, Inc., the global leader in speech technology for consumer electronics, is very pleased to announce it has received the 2014 Global Mobile Award for Best Mobile Technology Breakthrough at the GSMA Mobile World Congress in Barcelona. Sensory’s TrulyHandsfree™ Voice Control 3.0 was selected from among 680 candidates for the mobile industry’s most prestigious awards. TrulyHandsfree Voice Control 3.0 builds upon the success of Sensory’s TrulyHandsfree voice trigger that has become the preferred solution of mobile handset platforms for ultra-low power “always listening” technology for speech recognition, eliminating the need to press buttons. Sensory’s TrulyHandsfree 3.0 is widely deployed in over 40 industry leading mobile handsets, tablets, and wearables from companies such as Google, LG, Motorola, and Samsung. Hundreds of millions of devices have shipped with Sensory’s TrulyHandsfree and TrulyHandsfree has been ported to leading DSP/MCU IP core and chip vendors including ARM, Avnera, Cadence, CEVA, Cirrus Logic, Conexant, DSPG, Realtek, ST Micro, Synopsys, TI, VeriSilicon, and Wolfson. TrulyHandsfree 3.0 adds improved reliability and robust noise features to increase recognizer’s ability to perform with background music and in everyday noisy conditions. This latest version also adds multiple phrase recognition that responds to dozens of keywords and user-defined triggers/passphrases with biometric speaker verification and identification. TrulyHandsfree 3.0 additionally offers “trigger-to-search” capability for a query to immediately follow a trigger, and ultra-low power, deeply embedded implementations enabling true “always-listening” devices. Sensory, Inc. is the leader in speech technologies for consumer products, offering a complete line of IC and software-only solutions for speech recognition, speech synthesis, speaker verification, music synthesis and more. Sensory’s products are widely deployed in consumer electronics applications including mobile, automotive, Bluetooth™ devices, toys, and various home electronics. With its TrulyHandsfree voice control, Sensory has set the standard for mobile handset platforms’ ultra-low power “always listening” technology for speech recognition, eliminating the need for touching the device. To date, more than 40 mobile handsets, tablets, and wearables have shipped with Sensory’s TrulyHandsfree, and many more leading OEMs are expected to release Sensory technologies such as wake up triggers, command and control, speaker verification, and user defined triggers in their products.